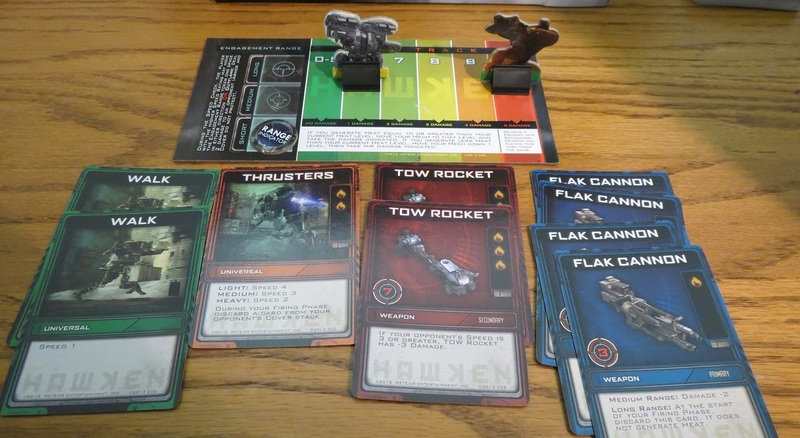 Hawken: Now with Inverted K, Also Cards | SPACE-BIFF! Sometimes I think it’s kind of sad that mechs are built for war, live out their short existence fighting one another, and then die in battle. Then I remember it’s actually awesome. 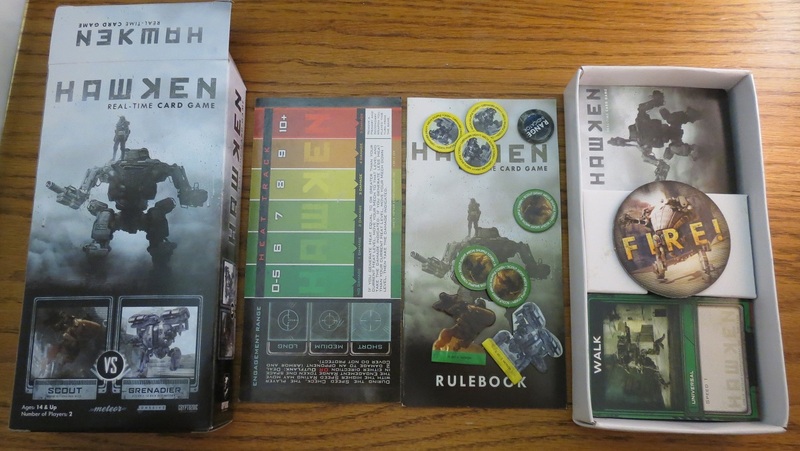 Meanwhile, Cryptozoic Entertainment is still in a whirlwind frenzy of making board games out of licensed properties, including the relatively recent mech-war PC game Hawken. What’s more, in order to capture the frenetic excitement of mech combat (we assume, since nobody’s done it yet; maybe it’s boring), they’ve decided to make it real-time. I know, I was thinking the same thing: huh? Well huh no more, because I’ve got the lowdown on what’s going on with the inspirationally-titled Hawken: Real-Time Card Game. Just another pair of mechs duking it out. While I’d love to delve into the nitty-gritty of what’s going on in Hawken’s undoubtedly well-researched speculative fiction, I fear I simply don’t have the space to do so here. For our purposes, we’ll leave aside all the piercing geopolitics and scathing indictment of drone warfare and just assume it’s about mechs shooting each other with rad exploding machineguns and homing missiles. Depending on which set you picked up, you’ve got your choice of Scout, Grenadier, Sharpshooter, or Bruiser mechs, each outfitted with a slightly different deck full of stuff like the thrilling “Walk” card that makes your mech move a bit faster, slightly-less-sarcastic weapons like TOW rockets and flak cannons for dealing damage, and others, from special abilities to armor to… well, that’s mostly it. With your deck held in one hand and heart aflutter, someone shouts “Ready set go!” and you’re off, peeling a single card from the top of your deck and slapping it down into your mech’s playing area, racing to add more of those movement, weapons, armor, and abilities cards to your array than your opponent. Now and then, you’ll draw a useless card — say, maybe another “Thrusters” card when you’re playing as a heavy mech whose attempts at using jet-packs are about as graceful as an obese penguin launching itself over a cliff, or an “Armor” card when you’re a light mech hoping for more thrusters — and you can play that worthless card facedown as “cover” to block incoming fire. After you have a few cards down (and hopefully a superior set to the one your opponent has assembled), you’ll jerk across the table and draw the “FIRE!” token, signaling that your mech has unleashed hell. Then the game pauses, which maybe isn’t as cool as unleashing hell ought to be, but it does give you a sensible opening to resolve all the cards spread across the table. Eleven damage, minus the enemy’s armor and cover. The resolution sequence is where Hawken’s most interesting ideas come to the forefront. First of all, one of your goals is to be moving faster than your opponent, achieved by a simple equation (“Walk” cards, minus “Armor” cards, plus whatever value of “Thrusters” cards your mech size gives you. SIMPLE. There will be a quiz). Moving faster lets you either flank your opponent for a couple damage or change the range your mechs are battling at, which makes certain cards a bit more or less powerful. For example, the Scout’s flak cannons are quite powerful at close range, hardly scratch mech armor at medium distances, and dissipate into comforting goose-down pillows at long range. The second cool idea is the way your mechs run the risk of overheating. Firing more ordnance at once generates more heat, which can result in damage to your mech if you exceed a certain threshold. Worse, cooling down can take multiple turns even if you don’t continue to generate a bunch of heat, so overheating too early can end the fight in your enemy’s favor before it’s really begun. It’s possible to play special coolant cards to decrease your heat more rapidly — or better, intentionally generate an inferno’s worth of heat to fire a whole barrage of grenades and aptly-named “Heat Cannons” to hopefully wreck your opponent, but the tradeoff will be some damage and, if too much energy is generated at once, even the permanent meltdown of your weaponry. These two systems are fairly nifty, and encourage you to balance the needs of your mech. Should you strive for speed or protection? Should you generate heat to blast your opponent this round, or are the long-term consequences too painful? It’s also neat the way each of the four mechs manages to feel different. The Scout is all about moving faster than his opponent, scoring flank hits and unleashing his powerful flak cannons up close, while the Grenadier has monstrous weapons that hit hard and ignore cover, but spark so much heat that he has a high likelihood of burning himself out. The Sharpshooter and Bruiser aren’t quite as easily differentiated, but both still have their perks, especially the former’s Slug Rifle, which deals very little damage until it’s stacked with a bunch of duplicates. Then it obliterates everything. The Scout vs Grenadier set. 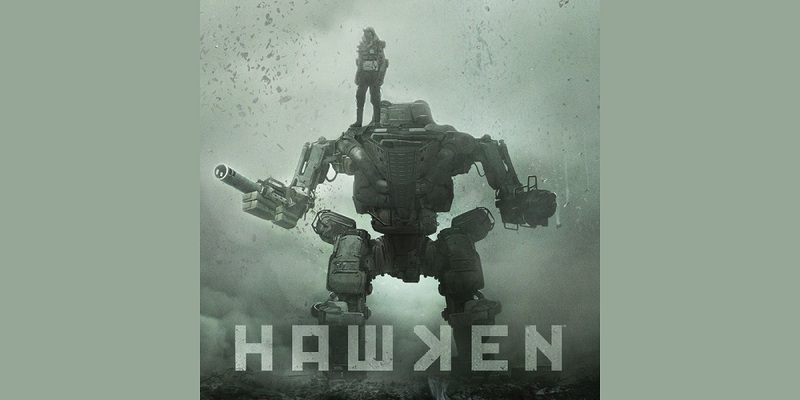 Unfortunately, there are a couple issues holding Hawken back, the worst of which is its central real-time gameplay. Hawken suffers from a discouragingly limited decision space. You draw a single card, decide whether to put it into your mech’s array or lay it facedown as cover, and that’s it. Oh, and you eventually decide whether to nab the “FIRE!” token to end the round, but that doesn’t really help the fact that you’re working with just one card at a time and your decision is 90% “Do I put this down or use it as cover?” While this makes Hawken simple, it also means there’s quite a bit more luck than skill or control required. Unless you’re playing much faster than your opponent — like, say, shaming your kids, in which case, shame on you — most of your options won’t turn out particularly advantageous. For instance, you could decimate an opponent by wrecking their cover with a grenade launcher, or move more quickly in order to change the range from long to medium so their sabot rifle doesn’t deal as much damage, but all of that is still contingent on drawing the right cards at that exact moment. Sure, most of the experience revolves around the panic of making those miniature and all-too-straightforward decisions right now, with no room for hesitation or any brain function higher than mere reflex. And yes, that fits the nature of the first-person multiplayer shooter this game is based on. And okay, there are those occasional moments where you’ll glance at your opponent’s side of the board and catch sight of the move they’re planning, and you’ll pull the exact right card that will mess up that plan and you’ll feel like an amphetamine-chomping genius. But those good moments are few and far between. Most of the time, you’ll just get grumpy that you played Camouflage to finally make all your normally-pointless cover cards suddenly worthwhile, but your opponent happened to obsolete them by slapping down a hand of grenade launchers in a blind panic, and too bad for you. The Scout closes in and burns hot for the kill. While there are a couple cool ideas hiding beneath Hawken’s mostly-tungsten skin, its lack of a real decision space meant it was an overall disappointment for me and mine. I’m not saying it won’t appeal to someone, because it’s fast and panicky and vaguely enjoyable for it, but I don’t see it having any sort of long-term appeal for most people. There are already two sets available and they come with rules for customizing your own mech, and clearly Cryptozoic would love to sell you many Hawken sets now and in the future, but I don’t think there’s enough of a system here to warrant that sort of property-milking, badass mechs or no. Posted on March 3, 2014, in Board Game and tagged Board Games, Cryptozoic Entertainment, Hawken Real-Time Card Game. Bookmark the permalink. 1 Comment. Thumbs up for yet another Cryptozoic title that won’t tempt me. Thanks for saving me the money.